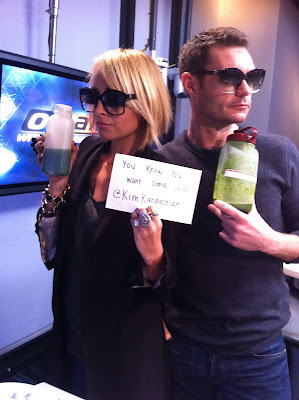 Nicole Richie in the studio with Ryan Seacrest. 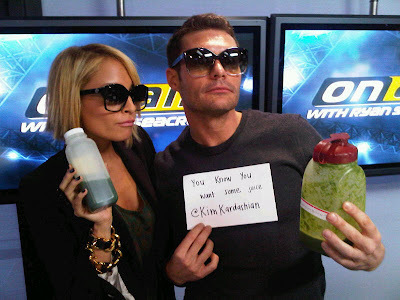 Ryan Seacrest tweeted this picture of himself with Nicole Richie and her daily health juice which Kim Kardashian hates! I am loving that Nicole Richie is wearing her vintage Chanel dog collar, I am also loving Nicole and Ryan's House Of Harlow shades. Head over to Kiss FM to listen to Nicole Richie on Ryan Seacrest's show. I am somehow curious, how this drink/smoothie really tastes... Does anyone have the recipe? I love the shades !